GreenTech Automotive, the controversial electric car manufacturer co-founded by close Clinton ally Terry McAuliffe, has failed to make the first payment on a $3 million loan from the state of Mississippi. McAuliffe is now Democratic governor of Virginia. GreenTech was financed in part by EB-5 visas granted to Chinese investors helped through the political approval process by Tony Rodham, Hillary Clinton’s brother. Electric car maker GreenTech Automotive, which once planned to build 250,000 cars a year and invest $2 billion in an impoverished corner of Mississippi’s Delta region, has missed a debt payment to the state of Mississippi. Mississippi Development Authority spokesman Jeff Rent confirmed Monday that the Tunica County company didn’t pay $150,000 due June 30. That was the first payment on a $3 million state loan. McAuliffe served as co-founder and chairman of GreenTech Automotive from 2010 to 2012. He remained a large shareholder in GreenTech Automotive after his resignation, but recently said he has divested all of his interests in the company. As of August 2013, the only visible assets associated with the privately held company are the manufacturing equipment located in a leased Horn Lake, Mississippi production facility and a 100 acre field in Tunica County, Mississippi the company says it has invested $6.6 million in to make it ready for the construction of a manufacturing facility where electric vehicles will be built. To date, that construction has not yet begun. $7.5 million from Chinese national EB-5 investors before the Department of Homeland Security’s US Citizenship and Immigration Services (USCIS) California regional center director halted the issuance of I-526 petitions to GreenTech EB-5 investors in July 2010. $5 million in loans from the state of Mississippi. 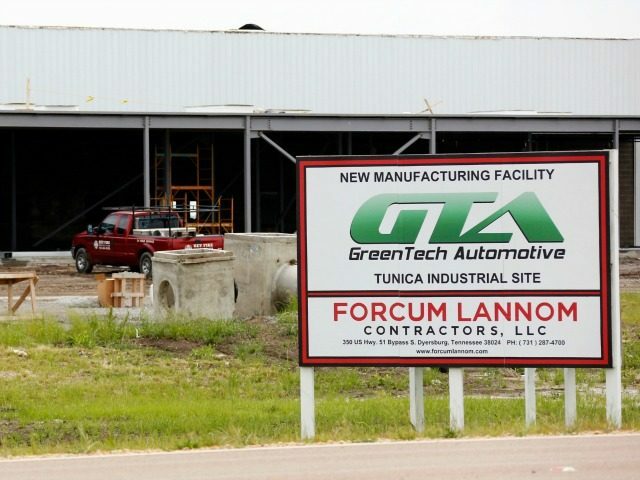 $3 million was loaned directly to GreenTech Automotive, and $2 million was loaned to Tunica County to acquire the 100 acre field from a local businessman. That 100 acres was subsequently transferred to GreenTech by the Tunica County Economic Development Foundation. Breitbart News confirmed with the Mississippi Development Authority on July 22 that these loans have been completely disbursed. $25 million in EB-5 investments made by 50 Chinese nationals made subsequent to a September 1, 2011 decision in which USCIS director and current Obama administration nominee to become the next Deputy Secretary of Homeland Security Alejandro Mayorkas overruled career DHS officials and removed the halt on I-526 petitions placed in July 2010. Shortly after Virginia based American Immigration Center LLC took a controlling interest in Gulf Coast Funds Management LLC, Anthony Rodham, younger brother of Hillary Clinton, was named CEO of Gulf Coast Funds Management. The company’s offices were moved from New Orleans to a Tysons Corner, Virginia office which it currently shares with WM GreenTech Automotive Corp., the parent company of GreenTech Automotive Inc. In addition, former Democratic Louisiana Governor Kathleen Branco, Margaret Richardson, former IRS commissioner during the Clinton Administration, and Randy Wright, a former Virginia official, were named to the company’s board. “An inspector general’s report published March 24, 2015, said McAuliffe received favorable treatment from former immigration services chief Alejandro Mayorkas in 2011, when the GreenTech chairman and future governor sought help getting EB-5 visas approved for foreign investors in his fledgling car company,” the Roanoke Times reported. How the $37 million in cash raised by GreenTech Automotive under McAuliffe’s leadership remains an unanswered question. One thing GreenTech Automotive has done very little of with that money is produce cars. That conclusion helped prompt officials to reject an EB-5 green card application filed by a GreenTech investor from Inner Mongolia, China, according to a 34-page U.S. Citizenship and Immigration Services decision obtained by The Roanoke Times. . . Under the federal program, foreign nationals who have invested at least $500,000 in a domestic business venture may receive green cards if they show their investment generated at least 10 jobs or comparable economic value. An investor seeking a green card may present either tax records of 10 qualifying new employees or a company business plan that demonstrates a need for 10 new employees and lists their likely hiring dates. Nicholas Colucci, chief of the federal immigrant investor program, signed the decision that said companywide payroll at GreenTech, which operates an office in McLean in addition to the Tunica factory, totaled 75 people. The decision also dismissed a company projection that GreenTech would employ 125 people this year, 175 next and 250 in 2018. Besides the $3 million loan, Mississippi also loaned Tunica County $1.9 million to buy the site for GreenTech. The company has also been certified for state tax breaks exempting it from state income and franchise taxes for 10 years. Mississippi officials said in May they were renegotiating agreements with the company because GreenTech failed in its pledge to hire 350 workers. News of the financial troubles of the Clinton-aligned Chinese EB-5 investor financed GreenTech Automotive comes at a bad time for Democratic nominee Hillary Clinton, whose questionable financial dealings have been well documented in the best-selling book by Breitbart Editor Peter Schweizer, Clinton Cash.